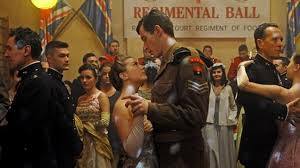 Queen and Country, the new semi- autobiographical film from writer/director John Boorman (the semi part) is a sequel to Boorman’s earlier film Hope and Glory, an episodic comedy about a young lad’s picturesque adventures during World War II. When we last saw the wee Bill, he had arrived at school to see it on fire from having been bombed during the Blitzkrieg, prompting him to yell out, “Thank you, Adolf”. It’s nearly a decade later now and Bill is an older teen and is conscripted into the army during the Korean War. How you respond to Queen and Country will probably depend on how you respond to the way Bill is dramatized here. Personally, and to be ruthlessly honest, I found him a poor excuse for a human being who, first, has an amazing inability to fully comprehend just how lucky he is, and second, for someone whose future lies as a filmmaker, an amazing inability to understand, empathize or read the people he interacts with. The movie begins with Bill swimming in the River Thames. His family has a house on an island there. I’m not sure whether that’s supposed to be symbolic or not, but our hero does seem to be incredibly cut off and isolated from reality. As Bill swims, he catches sight of a German officer getting shot over and over again, which turns out to be a film shoot (his home is downstream from the famed Ealing Studios). The movie ends the same way, but this time with him being the director filming a scene with his future wife. In between these scenes, he never really seems to learn anything about himself, or if he does, it’s a bit too little, too late to be emotionally effective. In fact, these scenes of filmmaking feel a bit ironic, since the character has difficulty telling reality from his own fantasies of what life is really like. The bulk of the story concerns Bill’s adventures in the army, getting through basic training, and ending up teaching other recruits how to type, under the overly watchful eye of their commander Bradley, who reports those under him for the minutest peccadillos. And this is where Bill’s lack of awareness kicks in. He finds his duties as teacher a personal affront and a monumental inconvenience. Never once does he seem to realize just how fortunate he is that this is actually how he’s going to spend his military life rather than, say, being sent to the front, where the inconveniences are a bit more, well, inconvenient, like loss of life, limb and mental instability. Instead, he’s stuck with Bradley, a commanding officer whose demands are dramatized as little more than petty annoyances. Besides Bradly, Bill mainly interacts with two other people: Percy, a fellow soldier who quickly becomes his BFF and co-teacher; and Redmond, a lifer who has learned how to game the system in order to do as little as possible. But again, Bill shows an incredible lack of insight. He never seems to realize that Percy is little more than a sociopath who has no qualms exploiting Bradley’s mental issues (a condition so obvious, it’s hard to understand how Bill could miss this) in order to take him down, and who is quite willing to let Redmond take full blame for the theft of a regimental clock (with great sentimental value) even if it means Redmond gets sent off to the Korean front, while Percy gets away Scott free. Another of the ironies here is that Bradley, whose values are criticized within the context of the film, is the only one who has the strength of character to own up to his own guilt (he turns himself in after being entrapped into breaking military law), while Percy only has the strength of character to do…well, nothing requiring strength of character. In the last few minutes of the movie, there is some indication that our hero finally…finally…might be beginning…beginning…to have a slight inkling that maybe…maybe…his judgments may have been just a bit off during a visit to a military hospital. But if he does, it quickly passes and he gets on with his life, the same person he was at the beginning. And if that’s the point, that’s fine. There are characters who never change, or never come to realize something about life or themselves. I’m just not convinced this was Boorman’s intention. The best performances are given by the supporting performers with David Thewlis, a member of Mike Leigh’s stock company, being very empathetic as Bradley; Pat Shortt (of such films as Calvary and The Guard) channeling the Carry On movies as Redmond; and Richard E. Grant (earlier of Withnail & I and lately of Girls) as Major Cross. And with Callum Turner as Bill and Caleb Landry Jones as Percy. 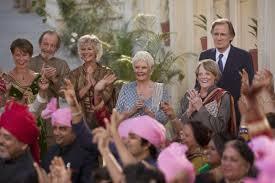 I’m not sure why the producers of The Second Best Exotic Marigold Hotel (the clever title to the sequel to The Best Exotic Marigold Hotel), and the writer Ol Parker and director John Madden (who gave us the first film), simply don’t cut out the middle man and make this concept a television series. The movie, about a group of older British citizens finding it cheaper and emotionally richer to spend their golden years in India, or, as one might term it, the continuing adventures of the Raj returning to the Jewel in the Crown, seems a perfect fit for night time soaps. But tis not to be, it seems; at least for now. This time round, it’s still fun to see a cry of great players still proudly playing, but the story seems perfunctory and not particularly exciting. You’re more waiting for all the myriad storytelling strands to resolve themselves so you can check out and go home. The usual suspects are here: Judy Dench, Maggie Smith, Bill Nighy, Celia Imrie, Ronald Pickup, Diana Hardcastle and Penelope Wilton have all returned and none have yet to overstay their welcome. Lillette Dubey (Monsoon Wedding, The Lunchbox) as Mrs. Kapoor has also returned, more stunning and beautiful than ever. New to the story are Richard Gere (whose through line feels a bit forced) with a magnificent mane of white hair as a lost man thinking of writing a book; Tamsin Greg of Episodes as a younger resident; and David Strathairn, all empathetic gravitas as an empathetic businessman. The story revolves around our hapless hero Soony (Dev Patel) trying to open a new hotel while trying to get married. Problems ensue when he thinks Gere’s character may secretly be working for the company they are trying to get money from, as well as when an old rival enters the story (here, I rather thought Soony’s fiancé fell a bit short as a future wife—I was on Soony’s side in his panicked reaction to his rival’s arrival and thought she should have been more supportive). Don’t worry. It all ends fine, with a nice balance of tears and joy, a nice yin yang balance.